Autorun-virus is a kind of viruses that writes itself on a flash drive (or other external device) and infect user’s computer when the user opens a flash drive in Explorer. This is a new type of viruses appeared in the time of widespreadng of flash drives, memory cards and other external devices. They have exactly the same tortious effect as all conventional viruses, beginning with spying on your computer and finishing with destructing your data. An Autorun-virus writes itself onto the flash drive and it makes a record in autorun.inf file to be launched when you double click on flash drive in Windows Explorer. autorun.inf is a system file, which is located in the drive root and tells Windows, which programs to launch automatically when you enter to the drive or what program to display in so called autoplay window – the window witht the list of actions that is displayed on flash drive conection. autorun.inf is a hidden file and therefore it isn’t visible on flash drive by default. In order to see it (and delete) you should open “Start Menu -> Service -> Folder settings” dialog in Windows Explorer, then select the “View” tab and check “Show hidden files and folders” in the additional options. Initially, the mechanism of Autorun was invented for the CD-ROM drive so that legitimate software supplied on CD-ROMs to be launch automatically when you insert CD-ROM to your computer or enter onto it with Windows Explorer. When a new kind of media: flash drives and external USB\SATA hard drives became widespread the developers of Windows “in a hurry” have transfered that feature to them, but they haven’t thought about possible problems. Unlike a CD a legal file autorun.inf can be easily changed by malware. At a friend’s place, who you came to download some necessary information. How to struggle with autorun-viruses? Of course, the regular anti-virus installation can help you to win the majority of such viruses. However, the number of different types of autorun-viruses is incredible, because it doesn’t necessary to have a high qualification to create such virus. In addition, autorun-viruses spread offline, and can therefore get to a technical service of the anti-virus companies for analyzing with a serious delay. Therefore, the best protection against such viruses is to completely diable autorun feature. 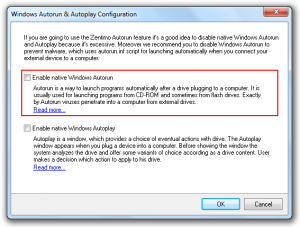 To disable Autorun you can use Zentimo “Windows Autorun & Autoplay Configuration” feature. 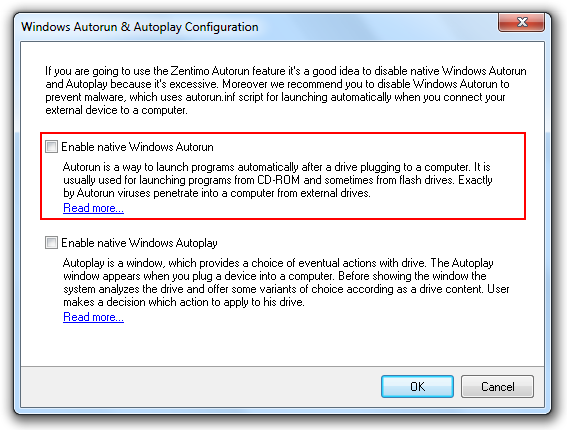 You can find the “Windows Autorun & Autoplay Configuration” feature through the Local or Global Autorun in Zentimo.